In the past, I have always enjoyed David Furlong’s directing but this time, even more so than usual. 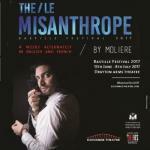 David Furlong’s staging of Le Misanthrope, probably Molière’s best and one of his most famous plays, uses a very interesting take on what has happened in the news over the last year or so. Between, Brexit, Donald Trump and the French elections, there was enough material there to show what was going wrong in our present society and why speaking the truth was more important than ever at a time when fake news and political lies have become the norm. But more importantly, David Furlong makes a great Alcestre. His acting is unpretentious and very modern. Not surprisingly, my favourite scene is the one he shares with Oronte when he gives him his view on the love sonnet he has written for Célimène. If you see the play, you will know what I mean. Great performance from both actors. This play deserves to be seen by a much bigger audience. (Performed at the Drayton Arms in South Kensington in 2017). Now at the Camden's People Theatre.